As millions tuned in to the nationally televised memorial of US senator John McCain attended by Washington power brokers, Trump left the capital to head to his golf club. 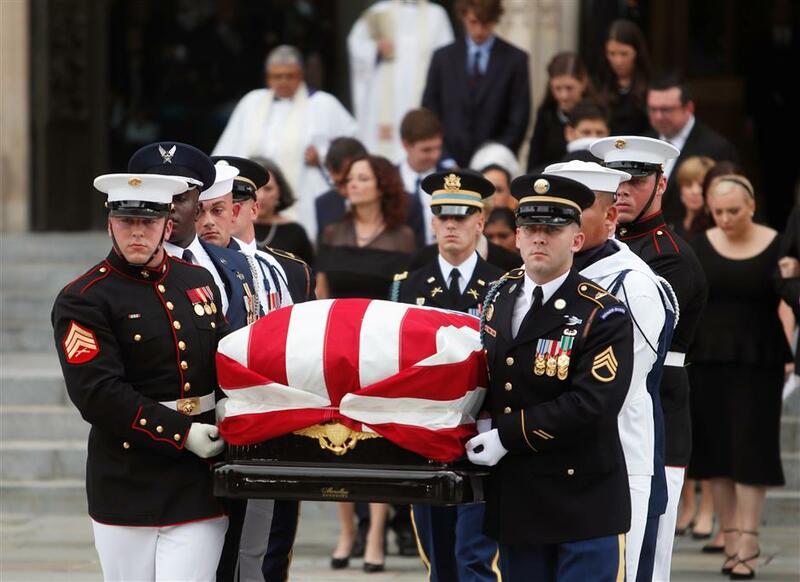 An Honor Guard carries the casket of the late senator John McCain from the National Cathedral in Washington on Saturday. Two ex-presidents from opposing parties united on Saturday to honor US senator John McCain, in a momentous funeral that championed his aspirations of political comity but also rebuked the tribalism and division trafficked by Donald Trump. As millions tuned in to the nationally televised memorial attended by the breadth of Washington power brokers, Trump himself was notably absent — leaving the capital to head to his golf club in Virginia just when eulogies to McCain were being delivered. And while Republican George W. Bush and Democrat Barack Obama offered subtle swipes at the current president, McCain’s daughter Meghan used the words of Trump’s campaign slogan to deliver a searing, unmistakable rebuke. “The America of John McCain has no need to be made great again because America was always great,” she said. He was echoing similar sentiments expressed minutes earlier by Bush, who defeated McCain in a “hard fought” Republican primary battle in 2000, only to see that bitter rivalry melt away into a lasting friendship. While Bush and Obama hail from different parties, their message was clear: US politics can rise to a higher level with the example set by McCain. McCain, who died last Saturday at age 81, had spent months organizing his funeral as he battled cancer. Meghan McCain delivered a tear-filled tribute to her father. And while Trump’s name was not mentioned, McCain’s daughter drew a clear and damning distinction between her father and Trump’s combative politics.